I was at St Andrews University in Scotland, when the accident happened … “the gravest technological catastrophe of the twentieth century.” It was 26 April, 1986. Reactor No.4 of the Chernobyl nuclear plant in Belarus collapsed. Today, over thirty years later, I can still remember the helpless panic that rattled through me … and I was almost two thousand miles away. 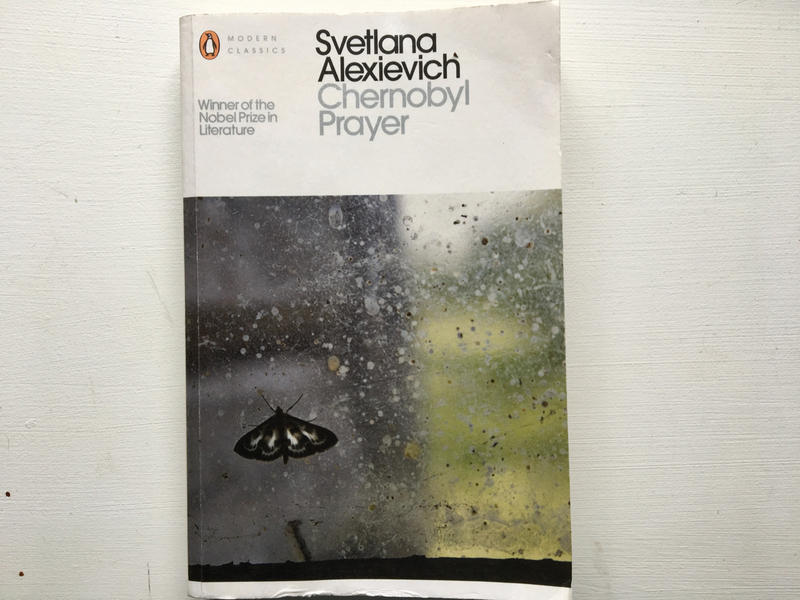 Svetlana Alexievich takes us much closer, right up to the nuclear plant itself in the minutes either side of the accident, and in the years beyond. How to understand nuclear disaster? The author uses the words of those who were there to talk us through the tragedy. The result mixes the every day with the unimaginable – through the testimony of ordinary lives it holds agony and audience together. Svetlana Alexievich is with us but her voice is heard only once, in her own chapter near the beginning of the book. For the rest she allows others who were there to guide us. Through her interviews they unfold the disaster as it happened in their lives, either on the day itself or during the fallout that came later. Arms scab over from contaminated laundry. Puddles glow with a strange light. May Day arrives and a parade is insisted on. All is well, and those who scrub clean the reactor without protection are heroes. Vodka is drunk, alarmist rumours of contamination squashed. Then, suddenly, whole communities are uprooted – pets and homes abandoned. Life before Chernobyl is lost. Children, the elderly, wives, parents, teachers, observers, bureaucrats, soldiers and scientists dig below the pain. They talk about silence and disbelief; about fear and sacrifice; about the power of propaganda; and about the collective paralysis of minds squashed within a system. The subject is apocalyptic but the book is not difficult to read. It catches with stories – heroism, deceit, passion and tragedy – and it urges a response, human to human. It remembers an awfulness and it warns. Chernobyl Prayer was first published in Russian in 1997. For further context to the book you might be interested in the links below. The first and the last are YouTube clips. A short interview with Svetlana Alexievich on how she encouraged the people she met to think about what had happened. A Telegraph review of a 2005 version of the book which was then called Voices from Chernobyl. A New Yorker article about Svetlana Alexievich and her writing on Chernobyl. Svetlana Alexievich’s speech at the ceremony where she received her Nobel prize for literature. This entry was posted in Books, Non-fiction, Reviews and tagged @penguinbooks, Anna Gunin, Arch Tait, Belarus, Chernobyl, nobel laureate, nuclear contamination, nuclear disaster, radiation poisoning, Svetlana Alexievich. Bookmark the permalink. Thanks for this intriguing review – I have now also read the Telegraph article you linked to too. Fascinating and simultaneously terrifying. Hi Gillian – thanks for your feedback.It is ‘fascinating and simultaneously terrifying’ but the genius of the book is that the author brings it within reach of all of us with the voices she chooses, and through them we can imagine, or at least begin to think about, how we would react. She helps us begin to learn. It’s a problem that belongs to all of us now and this is her warning.